Plyometric exercises are series of drills that utilize explosive forces in functional patterns to help you develop strength, power, and coordination. These exercises involve jumping. For instance, box jumps, lunges, skipping, burpees, jump squats, are all great examples of plyometric exercises. All of these exercises utilize a stretch-shortening pattern, also known as an eccentric-concentric pattern. We utilize this type of training in the advanced stage of rehab once you are ready to get back to doing the sport or hobby you love. As we repeatedly move in and out of this phase with progression, you WILL be able to perform better at your weakest point when you return to your sport or hobby. As the idea is to perform these exercises RAPIDLY, you can see where even tiny errors start to magnify. This is where we take plenty of time with you INDIVIDUALLY to analyze your technique and safety throughout these exercises. If you are just starting out with this type of training, it is good to start off with bodyweight only. As you find yourself progressing through these workouts with ease, you can add an elastic band, tubing, weighted ball, or weighted vest for external resistance but nothing excessive. Think about going from bilateral to unilateral activities to make things more difficult for yourself. Increased resistance should NOT be enough to slow you down NOR should it be compromising form. Also volume with plyometrics should be low 3 x 5 reps, is pretty standerend...not doing it for time or 30+ reps. If your an athlete who is looking to get back to their sport FASTER and at a higher level then On Track Physio can help! Sign up for a FREE discovery session to learn more. Speed is important for any athlete. The ability to accelerate quickly is what can set a good and great athlete apart. Being able to get up into top speed quickly takes technique, strength, and power. With these three drills we are assuming you have been addressing the strength component of your workouts. This video will show you 3 acceleration/sprint dills you can do on the field, court, or track in order to improve technique to better allow for the transfer of strength into power. Want to improve athleticism and start dominating your competition?! Check out my free tips report below, designed to show you exactly what youth and high school athletes need to include in their workouts! These exercises will build further upon the previous exercises listed below. So if you have not watched them, check them out first. In part 3 we include two exercises that start to incorporate reactiveness into the exercise. The hop prior to starting will initiate the stretch shortening cycle upon landing to start working the elastic component of the achilles as well as up the chain to initiate a sprint. By performing this in both the forward and lateral start postures it teaches the athlete how to really push off and get into the drive phase of acceleration. Using the bounce is another way to facilitate proper angles while working on strength and power eventually needed later on from a 3 point start. 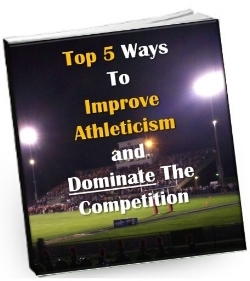 To learn more about how you can improve athleticism and start dominating your competition. Check out my free tips report for athletes below. In part two we are working on a 2 point start and a lateral start. Neither of these exercises utilize momentum (like in part 1) to help the athlete obtain proper body positioning. Coach the athlete to drive away from the line and punching their knee forward. Body should rise naturally and over a period of time such as an airplane rising for take off. These are two sprint variations that I will use with my athletes when they are first learning how to sprint. Often times coaches will have athletes start to low (or simulating like they are coming out of the blocks). However the problem with this is the athlete is often not strong enough to power out from this position to obtain the proper shin and torso angles for acceleration. By using a momentum start or falling starts you can get the athletes into better positions for acceleration until their strength levels start to increase enough to go down into a 3 point or 4 point stance. How to sprint faster and improve their forty time is a question a lot of athletes have and will ask me. Many athletes get confused by all the different exercises and advice that can be found online. Here is a simple grouping of exercises that I think pair well with each other. 1. The speed prowler push - focus is on speed not the amount of weight pushed. Weight on sled should really only be about 10%-20% of what you could maximally push. 2. MB chest pass with broad jump - Explode out and jump as far as you can forward. Perform lower repetitions and higher sets. 3. Deadlift - depending on where you are on the strength continuum and competition season the sets and rep scheme will change. If you cannot perform 1.5x bodyweight your focus should be with a weight you can perform 3-5 sets of 7-10 reps. If you have met that strength prerequisite you can start loading the bar up more and performing 3-5 sets at 2-5 reps.
Feel free to like, comment, share, tag video with friends who could use some more speed! Reign Superior Athletics is the gold standard program developed for all athletes. A solid foundational program is necessary to build a rock solid foundation level of strength, movement, power, and athleticism. I highly encourage all athletes to start with this program no matter your experience level. It has over 10 different workouts, so you can pick the specific one based off of your training experience and skill level. If you ignore the foundation, you will compromise your durability and full potential as an athlete!